Wed November 07 - general, Sat November 10 - 2nd Sat. Wed November 21 - general, Sat November 24 - 4th Sat. I have performed a comprehensive test of the Tape Analyzer's driver's ability to respond to simulated record read/write requests from the 1401. 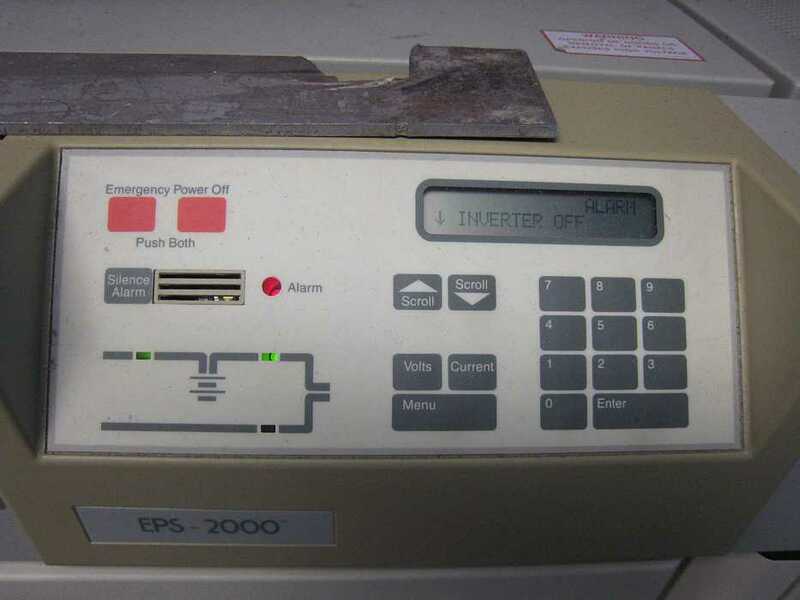 A hardware timer in the Tape Analyzer's PIC processor was used to initiate record transfer requests. It was set to generate a request every 50 milliseconds. When the timer triggered, the PIC would send an USB Event message to the Windows PC. This Event message indicates that the PIC has received a record from the 1401 an requests the PC to upload this record. The Event message is received by the driver and the driver sends a USB Command message to the PIC, telling it to upload the record from its buffer. The driver then receives uploaded record is received from the PIC and adds it to a large buffer (the Tape Buffer). The PIC timestamps all outbound messages with its timer value (each count in the timer value represents 0.3 mSec). 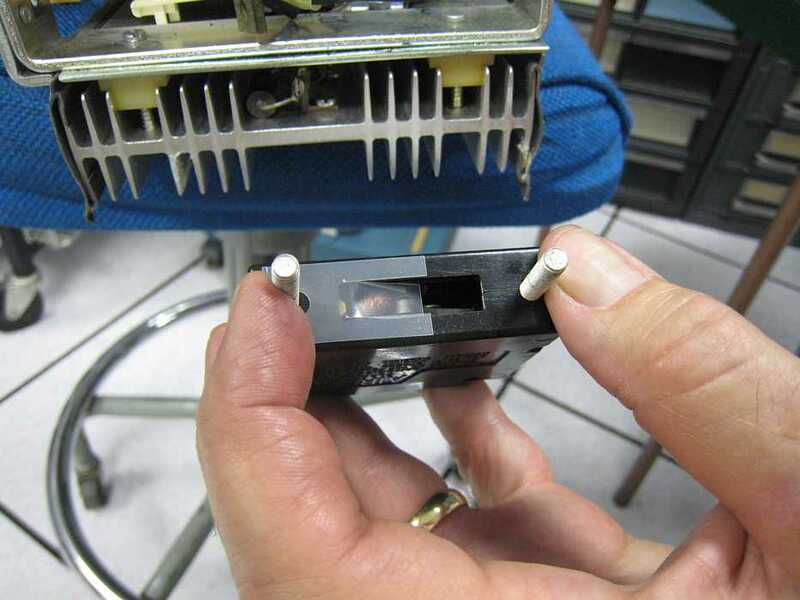 The large buffer represents a magnetic tape and is large enough to hold about 15 MBs. 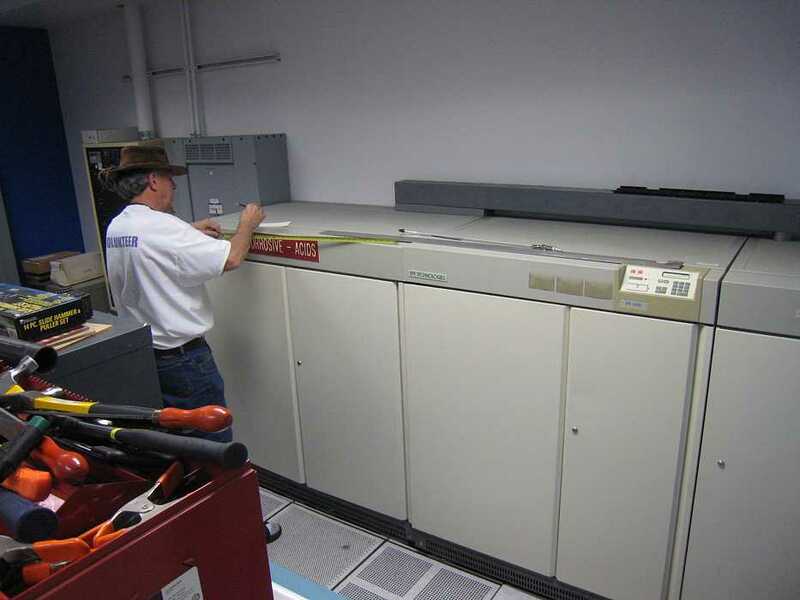 The above test was run until the records in the buffer exceeded 14 MBs; A total of 29,815 records. The elapsed time for the test was about 25 minutes. During this time several C++ compiles and internet downloads were performed. Compute heavy tasks like compiles are scheduled at the PASSIVE_LEVEL and are easily preempted by the driver's interrupt service routine. The downloads were expected to create more of a challenge, since our driver would be competing with the Ethernet driver's interrupt service routines. About 12 downloads were performed on files ranging in size from 500 KB to 9MB. Both the timestamp of the PIC's Event message and the timestamp from the PIC's response to the upload Command message are recorded, along with the record data in the Tape Buffer. The Tape Buffer if written to a disk file at the end of the test. 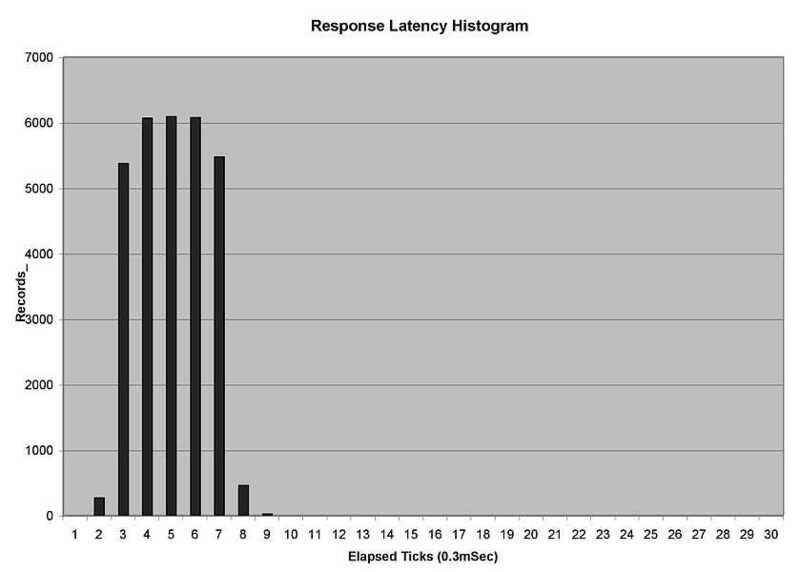 After the test, the timestamps in the generated disk file are analyzed to generate statistics on the driver's response latency. The test is performed on a Compaq X1010 notebook computer, 1.3 GHz, 512MB. Test duration: About 25 minutes. The test simulated a realistic 1401 tape session. The tested driver is slower than the production version, because it was generating a substantial amount console debug output that will be removed. Although the driver is not 100% complete, the remaining additions will not effect the performance sensitive paths. The test was successful with the worst case latency having more than a 50% safety margin. Note that the response time distribution is very tight. More than 99.9% of responses fall between 0.6 and 3.0 mSec. 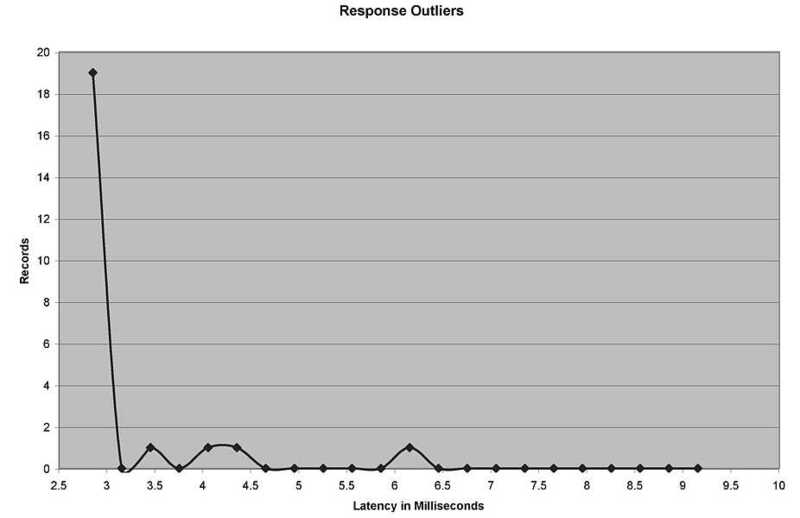 The worst outlier response time is about 6 mSec. Since our response time requirement is 10 mSec., I believe that the driver will be able to meet our requirements. Ron Williams was there, and Ed Thelen lurked about - but no tape people showed up. 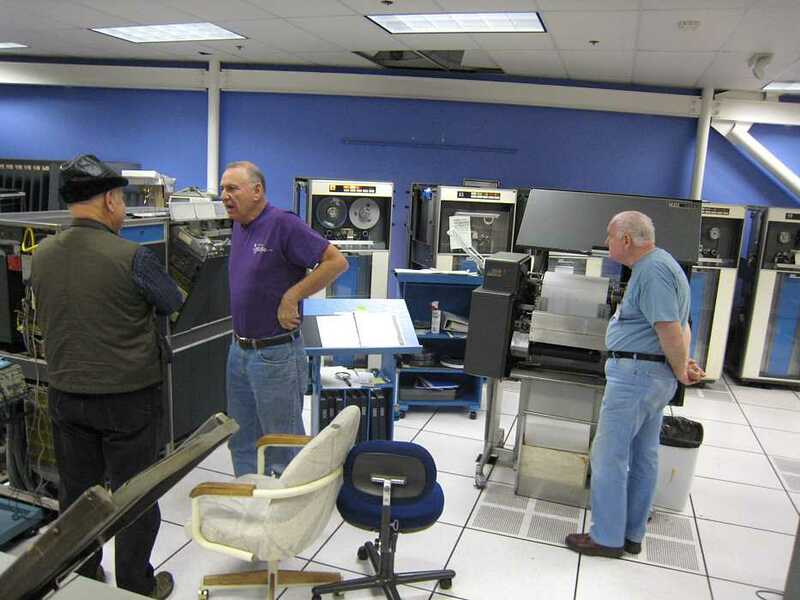 After a number of meetings, the Vintage Computer Festival was selected to provide a test platform for formal tours of the 1401. We have been giving informal tours and been handing out souvenir "powers of 2" and "BIG PRINT" printouts for over a year. Dan McInnis followed the plan, and is a real pro at speaking. Ron Williams was the 083 sorter operator and "computer operator". Ed Thelen collected visitor names and keypunched them for the BIG PRINT program. I ran the test again. This time I used 80 character records. During the test (about 25 minutes), I performed several simultaneous downloads and C++ compiles. The resulting distribution was even tighter than with the 496 character record test. The worst case response time was about 5 mSec. See the attached histogram. First, I need to update the driver documentation before I forget the changes. Then, I plan to focus on the PIC firmware. Previously, I implemented a skeleton of the needed functionality. Now I need to implement the remainder of the message command set and the interface to the 1401 Tape Channel. I am probably a month away from attempting to pass records between the 1401 and PIC. The overall design has been proved to be satisfactory to handle the required response times. Java Interface Classes - Java classes that provide access to the Tape Analyzer. (99% complete, modifications may be needed to make the Java Daemon easier to construct. Java Daemon - manages the tape file data and access to the Tape Analyzer. Java GUI Applets - The web browser user interface to all of the above. Jeff is working on the Java Daemon and Applets. The general plan is that I will work from the top of the above list to the bottom, while Jeff works from the bottom upward. We should meet somewhere in the middle. > ... Should we have an overall plan and recruit to it? Hopefully we have the Mod V reading & writing without error. We got the 'data' envelopes into spec last time we were there. I will check with Ron to see if he is still having read errors.. I have ''stolen'' brushes and installed them in one of the other drives. I have applied power and started to de-bug it. Two other drives have been completely rebuilt and are awaiting brushes. The last drive is awaiting reinstalling the rebuilt parts. Steal more brushes & put them into the Mod V because Bob or Ron can work on the one because it is all SMS logic. The 729 on the display floor has brushes & if the museum will allow is to borrow these until we get some new ones made we can bring up this drive. Glen & I can reinstall the remaining parts in 2 full work days. That will leave us with the 3 Mod II & IV's. One of them I have already started working on. Once we get brushes we can work on the II & IV's. The Mod II & IV are very mechanical, all relays & timers. We can have put two teams together and they can work side by side helping each other bring them up in parallel.. I ask the other team members for their ideas. 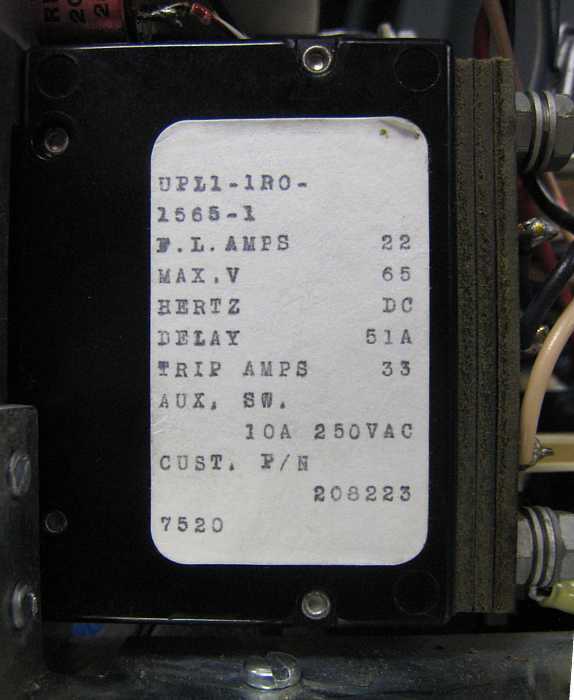 The original relay drives are called "RELAY"
Visible at 4:00 were Ron Williams, Bob Erickson, Allen Palmer, Glenn Lea, Stan Paddock. 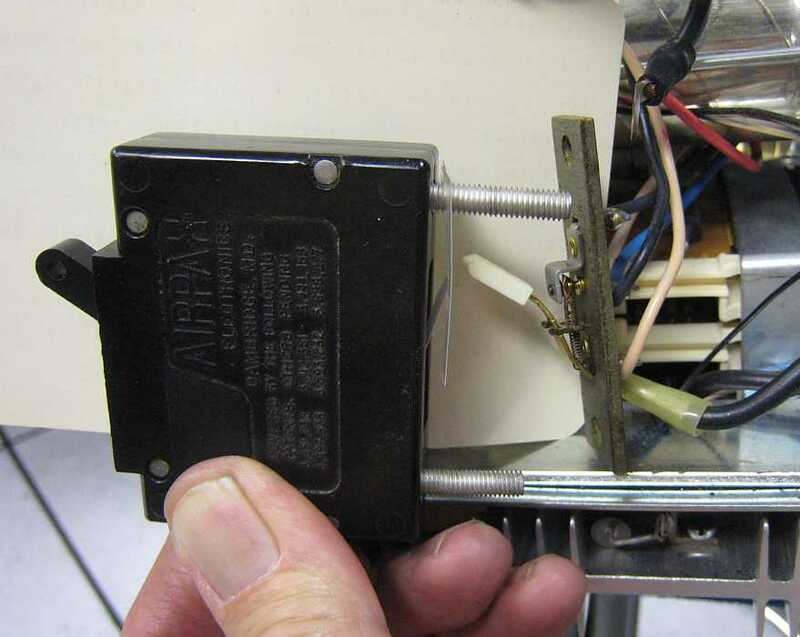 I reproduced a 250 card deck with no krinkled kards - try that again - no crinkled cards ;-)) Apparently Bob Erickson got some better rubber thingies that help push cards into the output stacker. But neither Stan nor I could figure how to finish the job by running the last cards out of the machine. 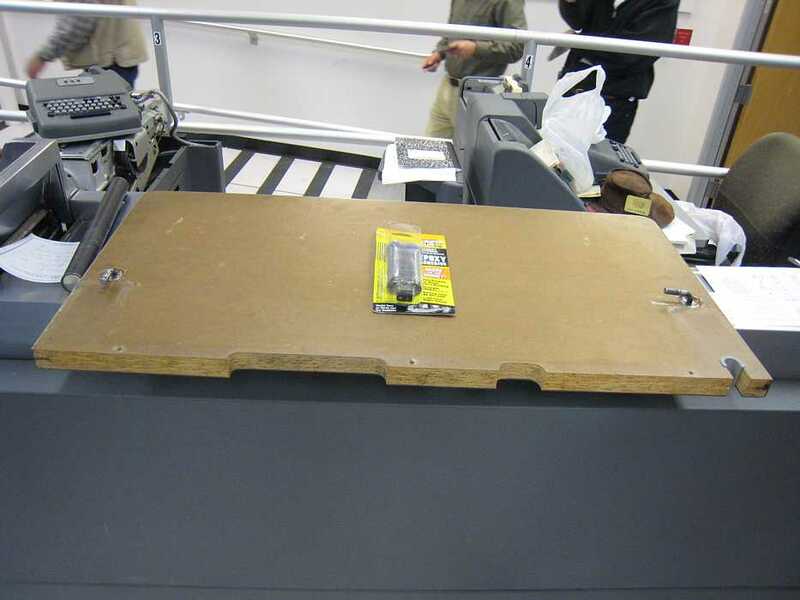 The name of the operation is "Run Out". As soon as the machine senses no more cards in the read input hopper, it just stops, with two cards still in the rollers :-(( Trying to cheat by depressing the input hopper card sense switch allows one more card to go through - but then the next card station senses no card, and stops again :-(( - So there is still a card left in the machine :-| - Like still in there right now. 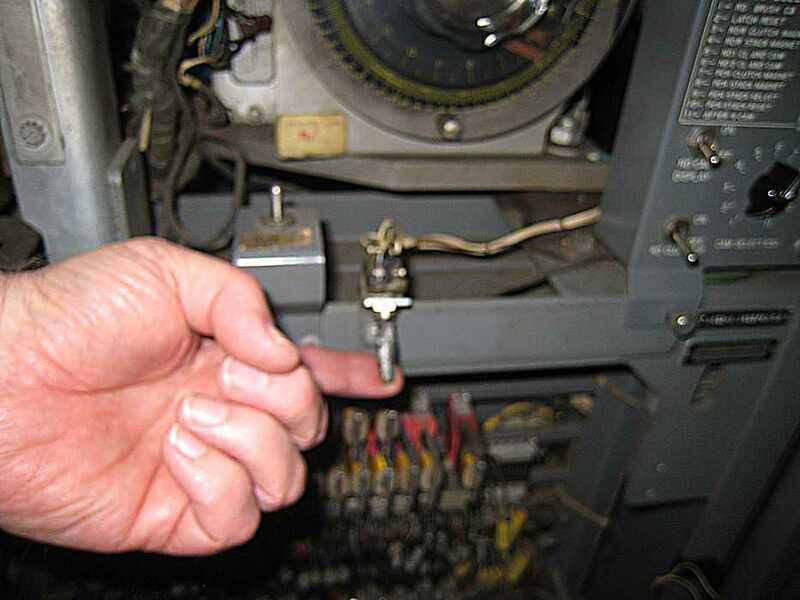 Turn on machine power (motor generator) with big switch on right of machine. ?How to run cards out of the machine? 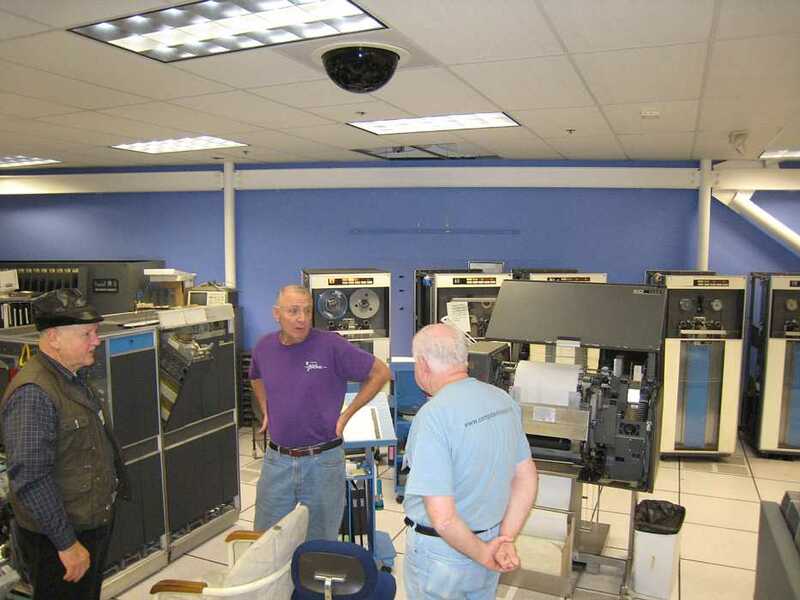 Bob Erickson wants to start working on an IBM 503 accounting machine that is in the museum somewhere. He got some spare type bars and adding counters from ?his garage?. 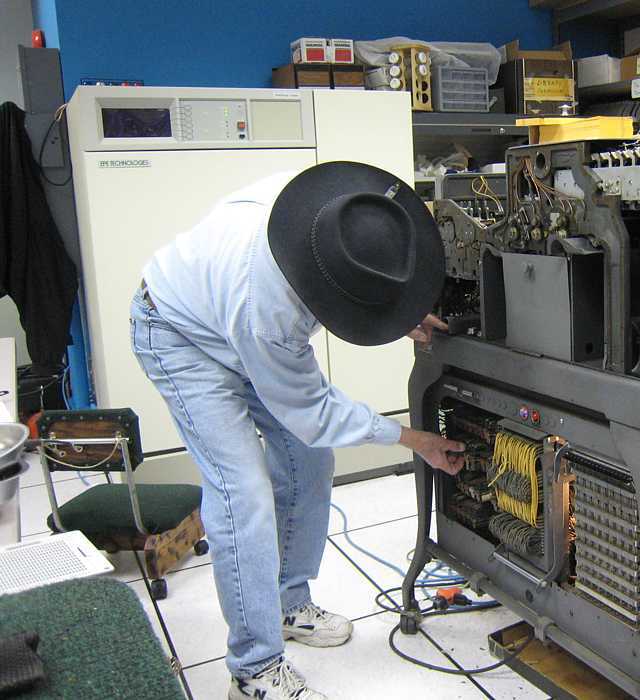 Stan Paddock is working to drive an IBM 026 from a PC so that we can punch cards from Ron Mak's ROPE. Stan is trying to find a premanufactured relay board so that he will not have to complete his home brew version. The search for an economical USB version (under say $400) is tough!! Stan and somebody got these breakers cleaned, (by rubbing an IBM card through the contacts while the machine was running) and this new 083 works perfectly. 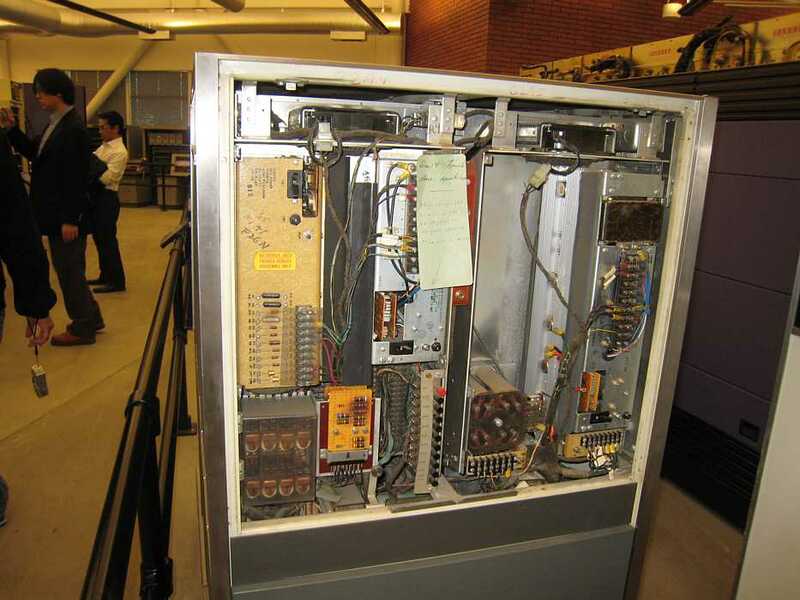 (The old 083 from Germany as been removed from the 1401 restoration room - we couldn't even get the rusty thing to feed cards reliably. This report is from Bob Erickson. 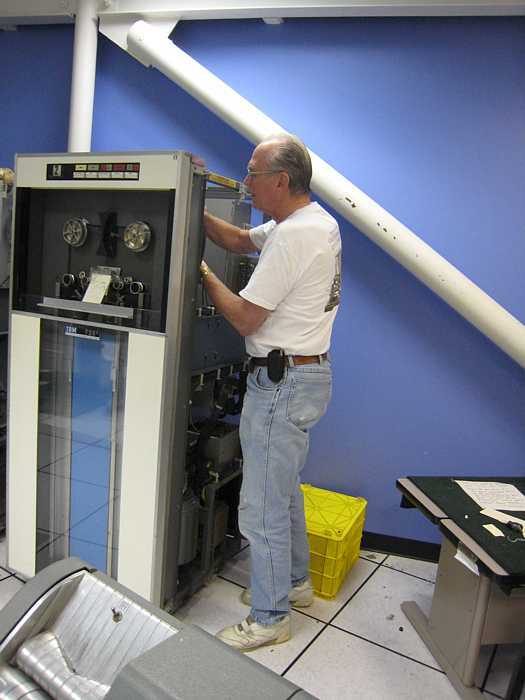 Duplicating cards in the IBM 513 is not reliable yet. The first four cards of a test deck were bad. Ron was duplicating a deck with the 1401. Heck of jam in the 1402 punch, maybe 10 cards. Took a while to straighten it out. Glen and Bob plan to talk Wednesday (14th) with ... about maybe making plastic (see through) covers on 513. 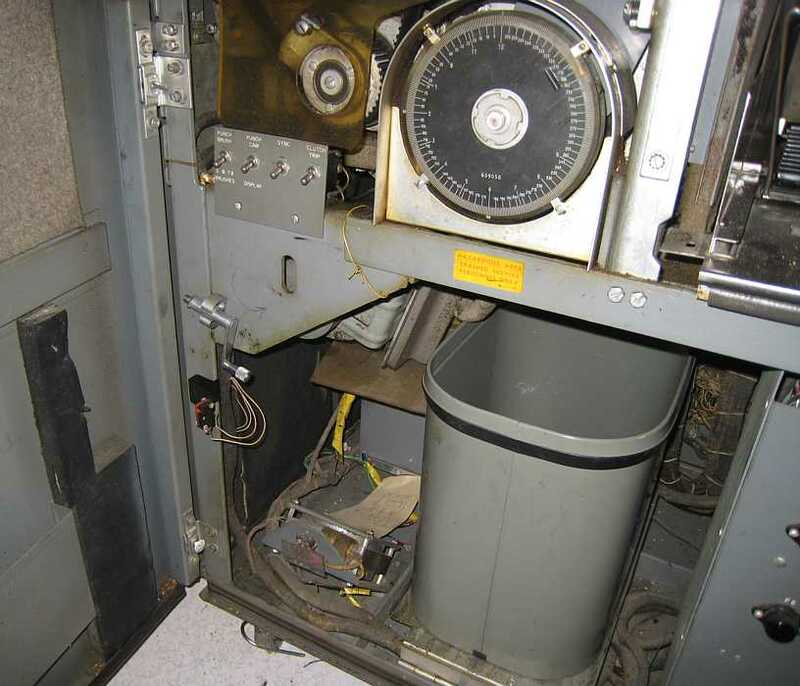 Wednesday, general talk about getting permission to restore IBM 403 accounting machine? Keypunch #1 died, ? swapped a tube, then OK. Will wait for Frank King to test the tubes in the machine. Present were (left to right) facing camera: (left picture) Bill Flora, Stan Paddock, Frank King, Joe Preston, Mike Cheponis, Glenn Lea, | (right picture) Glenn Lea, Bob Erickson, Jeff Stutzman, Allen Palmer, Ron Williams. Robert Garner showed videos of his New York adventure. 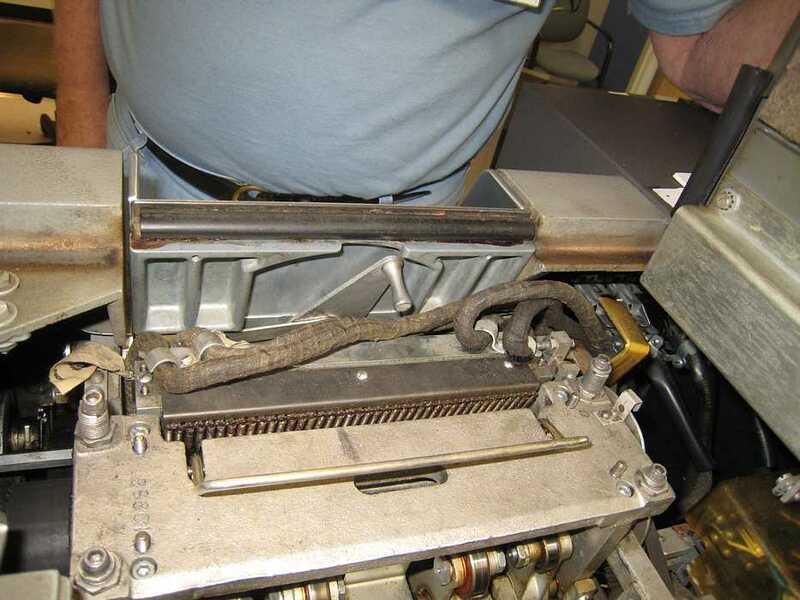 Bob Erickson and Glenn Lea made transparent cover plates for the IBM 513 summary punch. Brown paper adheres to the plastic during shipping and working to help protect the plastic from scratches. The plastic is fastened to the 513 using already existing holes in the 513. Bill Flora and Frank King want to upgrade the lubricants we use on the equipment. 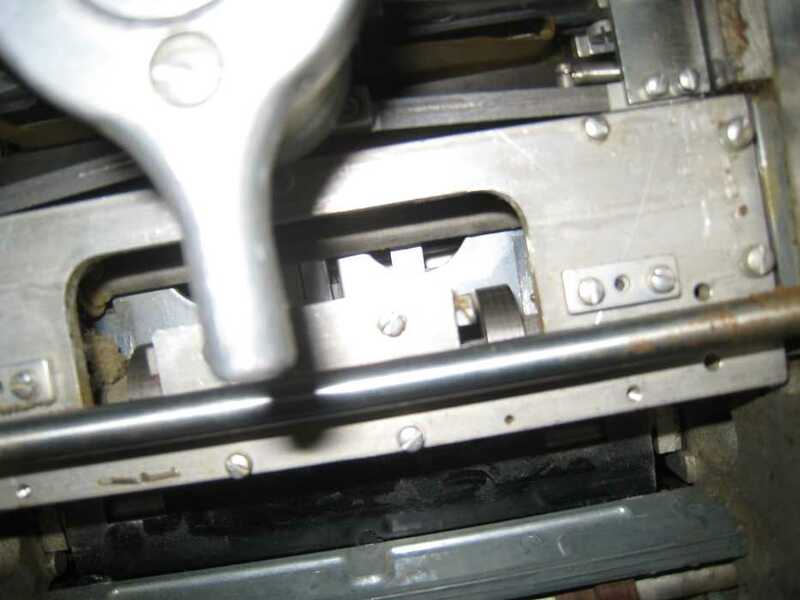 The lubricants used by IBM were modern in the 1930s, but great improvements in adhesion, wear, ... were made in the 1970s for automobiles and aircraft. 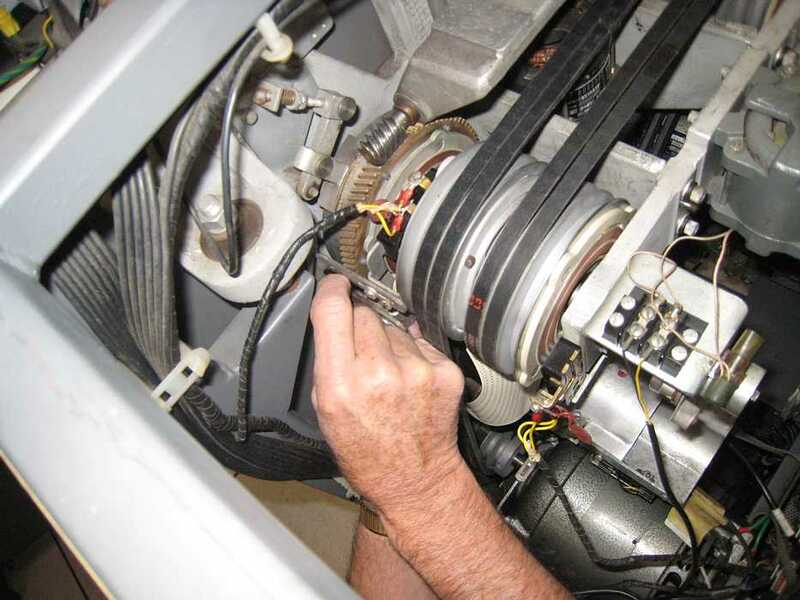 Here is Bill searching the LubriPlate web site for suitable "lubritection" replacements. Frank King is entertaining some visitors by sorting cards at 1000/minute, about 17/second. This report from Ron Williams, mostly. Glenn & I worked today installing the new brushes in our working drive. 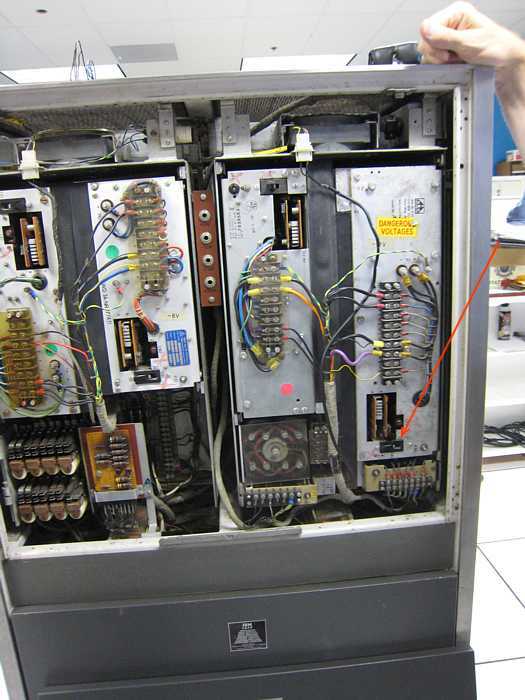 We turn the machine on, ran Ron's test - the one that fails most of the time - plus test decks 5000 & 5030 many times all without failure. Not sure exactly why it ran perfectly, only time will tell. Next item it to put more of the new brushes together and install in the other Mod V. Once they are in we will turn on power and see what we get. Hoping for a quick bring up ( don't we always at least hope) . Ron Williams, Stan Paddock, Ron Mak, Bill Worthington, Jim Somers - were at the 2:00 demo meeting. Ron Williams & Frank King changed the oil in the chain oiler, and did a standard chain cleaning. One print position died on wednesday, changing the driver card did no good - but started working again Saturday - driver signal looks good. 1403 look for back EMF - apparently looks for the back EMF - if incorrect back EMF, an error signal is generated - there was no error signal. 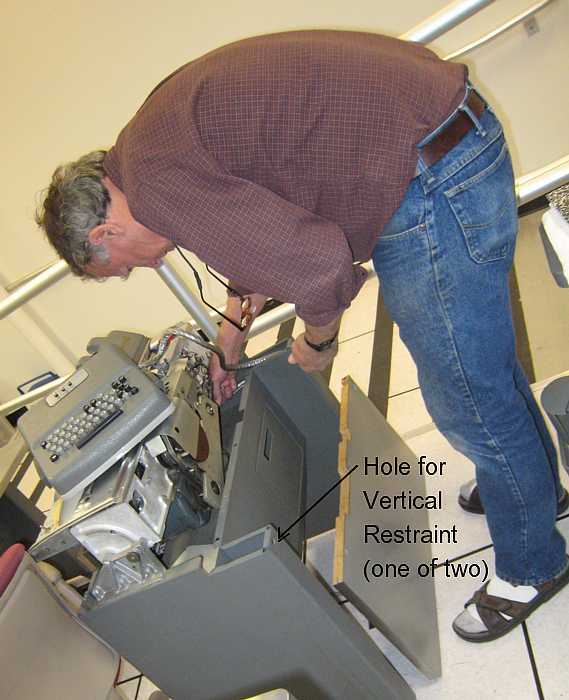 Frank wonders if the tape in the magnetic gap is worn? We put in an unauthorized substitute a year or so ago. This report from Ron Williams. 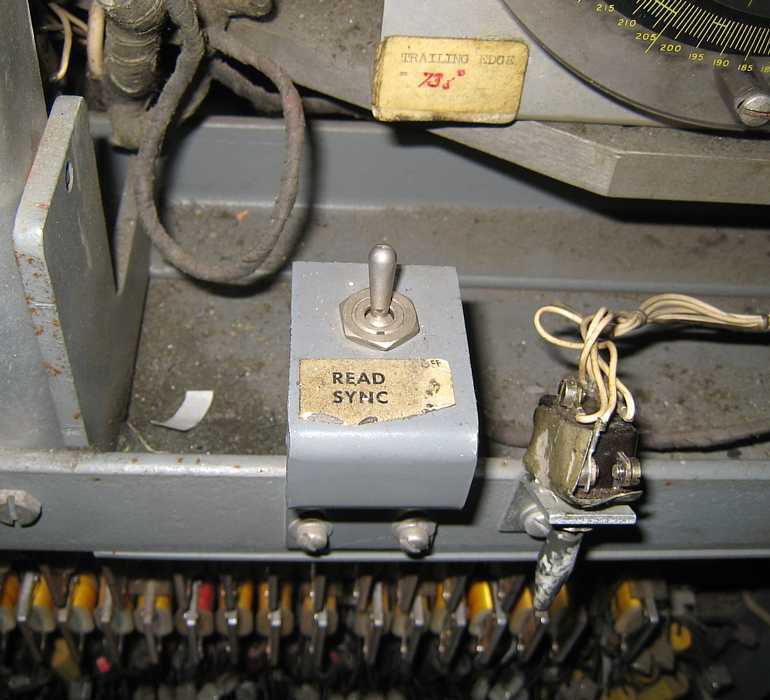 Stan and Ron repaired table on Sellam's keypunch. Folks should not try to lift 026 by the table. (It came here that way). 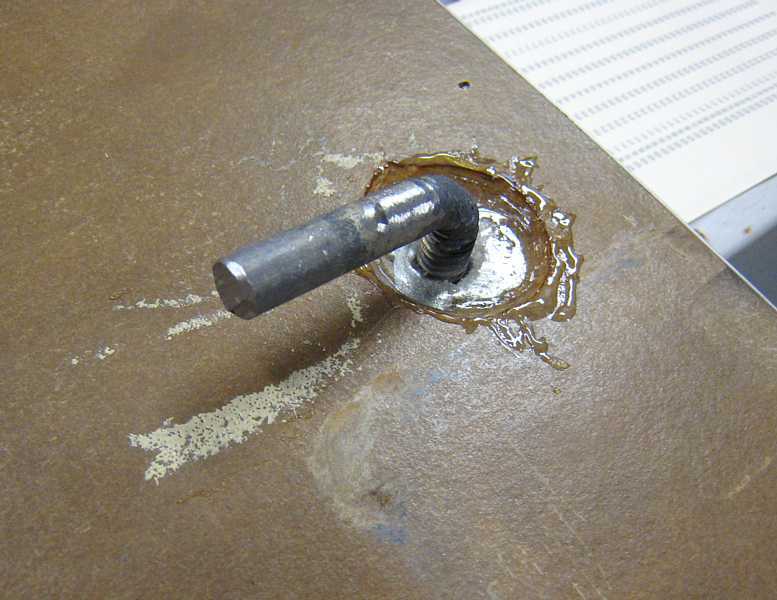 Wood screws and two part epoxy were used. One of ours has the same damage but the parts are not there, angled rod (threads into something that looks a Tee-nut (like in a furniture kit) - held in by tiny wood screws. MILES     DCW  001312              HOW MANY MILES DID YOU DRIVE? GALLON    DCW  13                  HOW MANY GALLONS DID YOU USE? Robert Feretich gathered up  the TAU electronics chassis and cables and left. 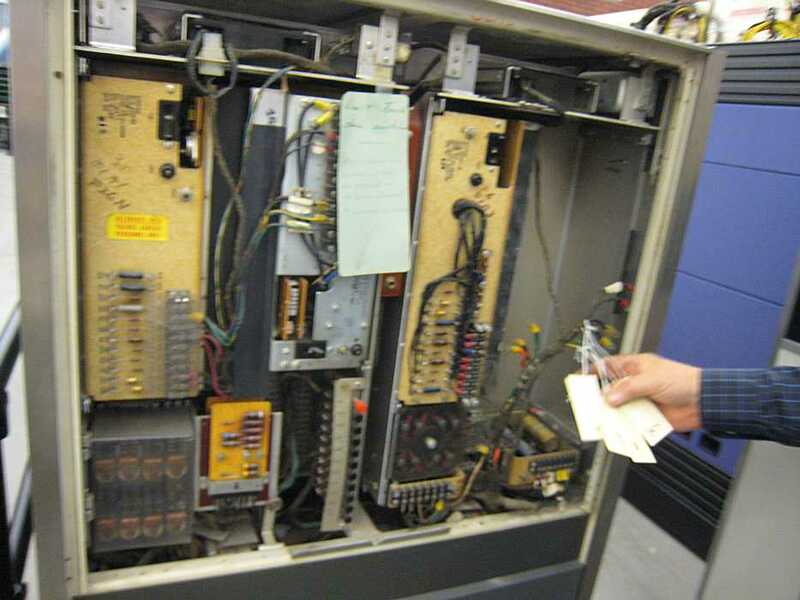 The 1402 card reader had a weird trouble - It would get Read Checks on any card. 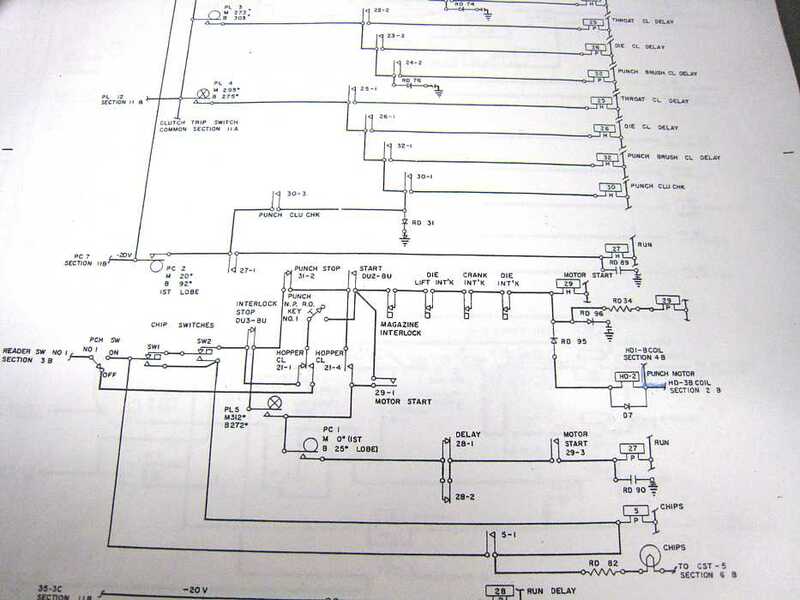 So, lets take a little tour of the 1402 interlock system - incase some other poor fool gets nailed. 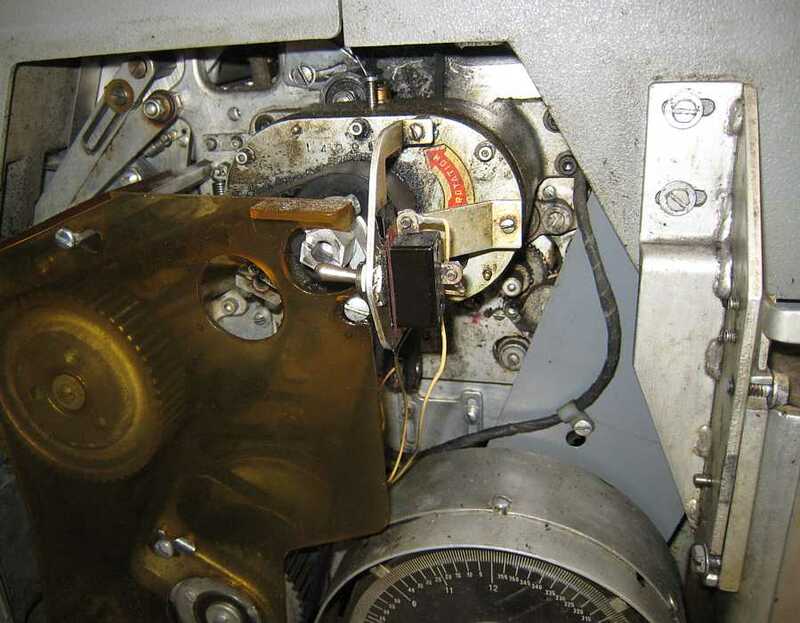 Punch die interlock - a real bear to close, even for experts !! Punch hopper release - somebody had played with this and the reader would not work!! This black handle has to be up - or is it down? 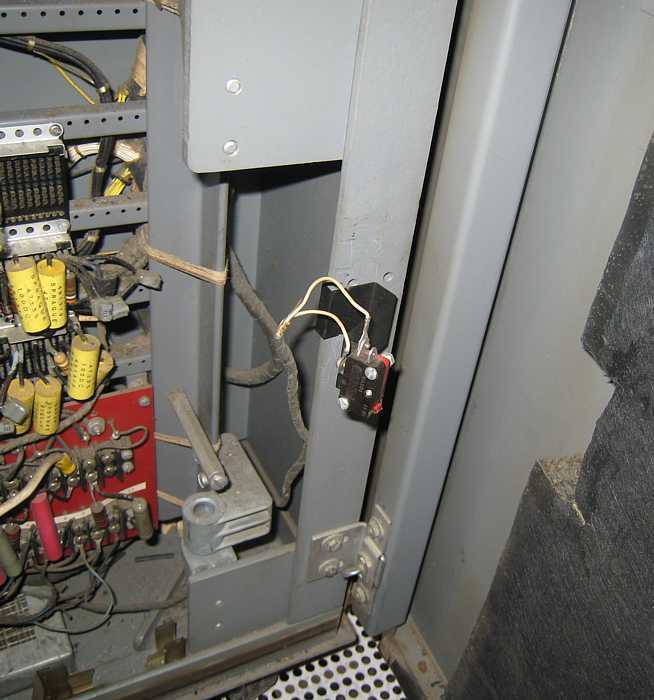 Interlock Override - pulled out is override, when door closes, the switch is pushed back and the override removed. Inside left front door, and some other switch(s)?? 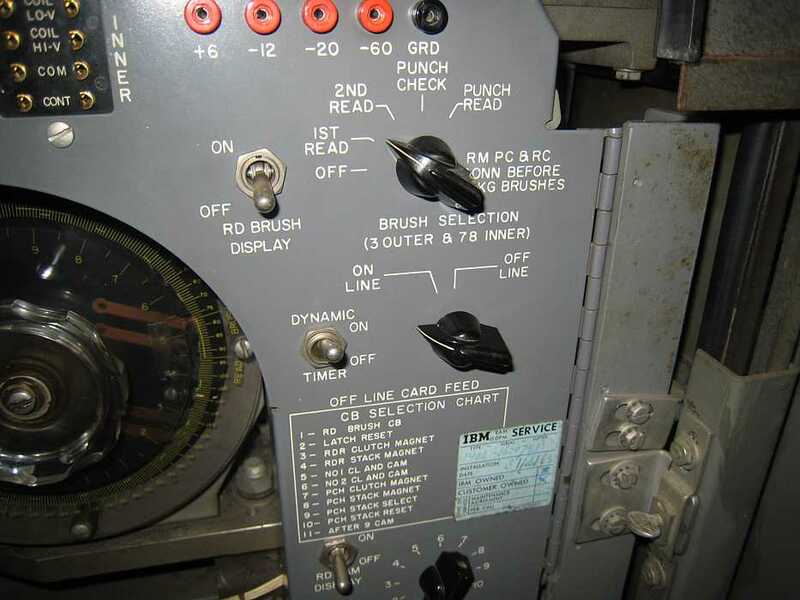 Back to the 513 summary punch - which can also also operate as a  gang punch and reproducing punch. that had been jumpered to get this far. punch check; lower right corner - a bit of the newly cleaned punch check comparitor. 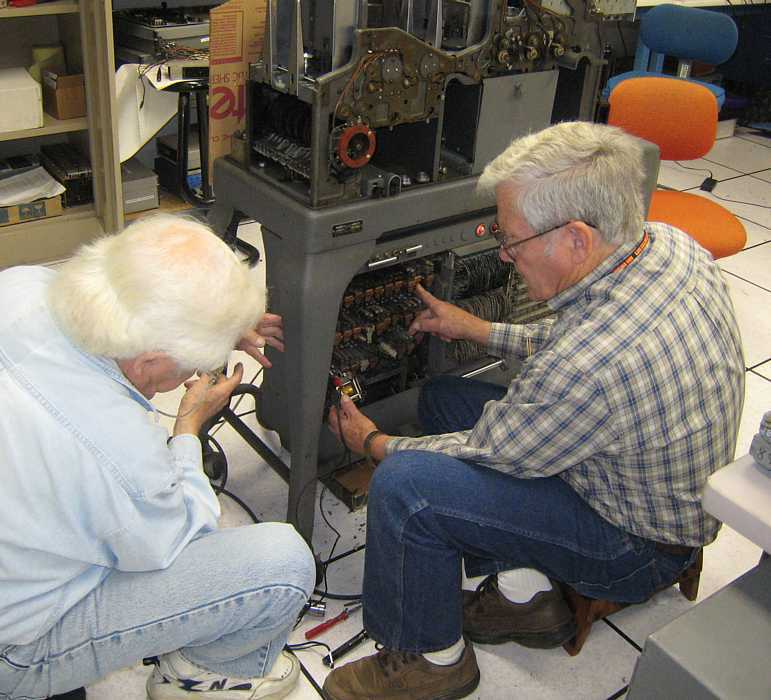 Here are Bob Erickson and Frank King examining a defective startup relay - did I hear dirty contacts?? 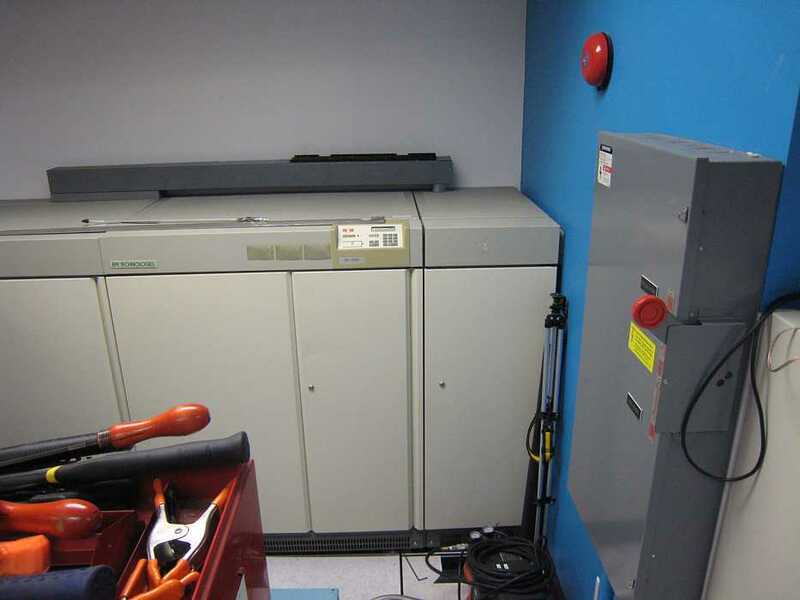 causes POWER-UP excitement every few months - the 1401 system starts to power up - then cycles OFF. Ron Crane has been very helpful in Circuit Breaker problems. and Dag Spicer arrived to hear Ron Williams plead our case. + 6 volt power supply. We of course promised to document and photograph the actions - as follows. 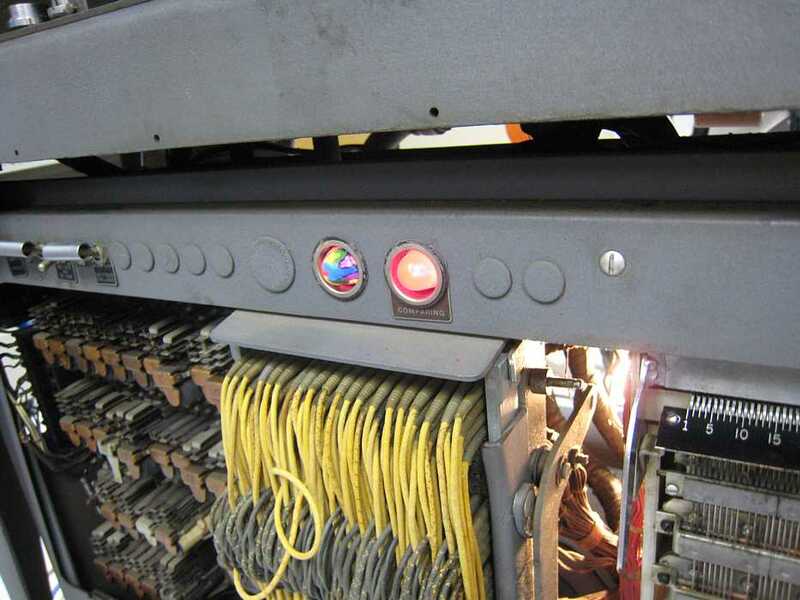 to external circuitry the position of the main switch in the circuit breaker - through the small brown, blue and black wires. an 126 by grabbing its table and doing whatever - but the table is not designed for that usage !! the two tables - two of the threaded angle rods had long since disappeared so Stan crafted two more. Notice the liberal application of 90 second epoxy. Occasionally frustration shows - The magnetic tapes have been a long time coming up. but failing 3050 - which writes a 10 character record then simulates spacing over bad tape with 10 "skip tape"
Allen is going through the cards loaded into the computer to get the gory details of what is in the machine. Allen and I stayed 'till about 7:30. Allen wrestling with the problem, I reading a good book - on magnetic magic. 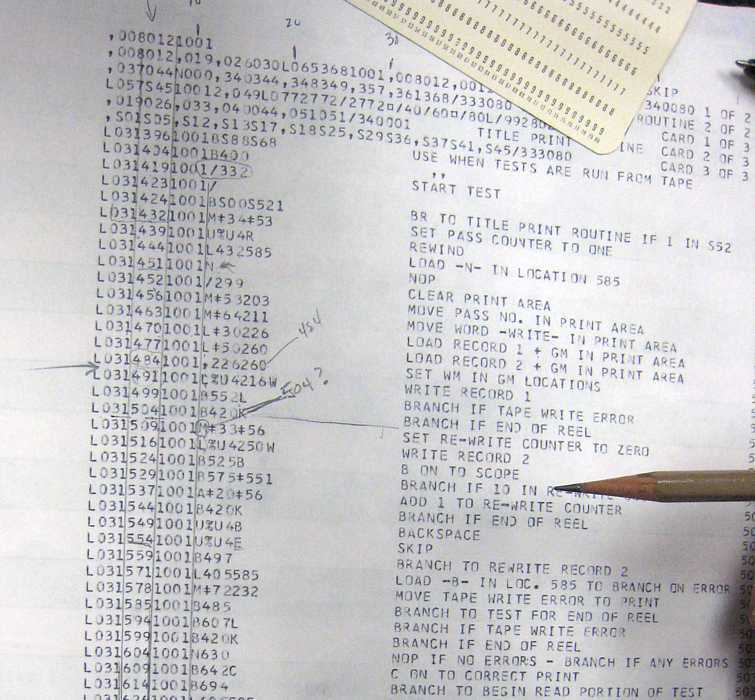 Allen has also worked out a satisfactory recipe for showing magnetic domains on magnetic tape. Much better than the recipe of May 26, 2007. - A very little magnetic stuff (Allen says "old, used magentic from the clutches". - Dunk tape into fluid, Shake off excess fluid before it dries. Finally gave up and took this shot. to get all of the above out of "our" room so we can cram in more of "our" stuff. 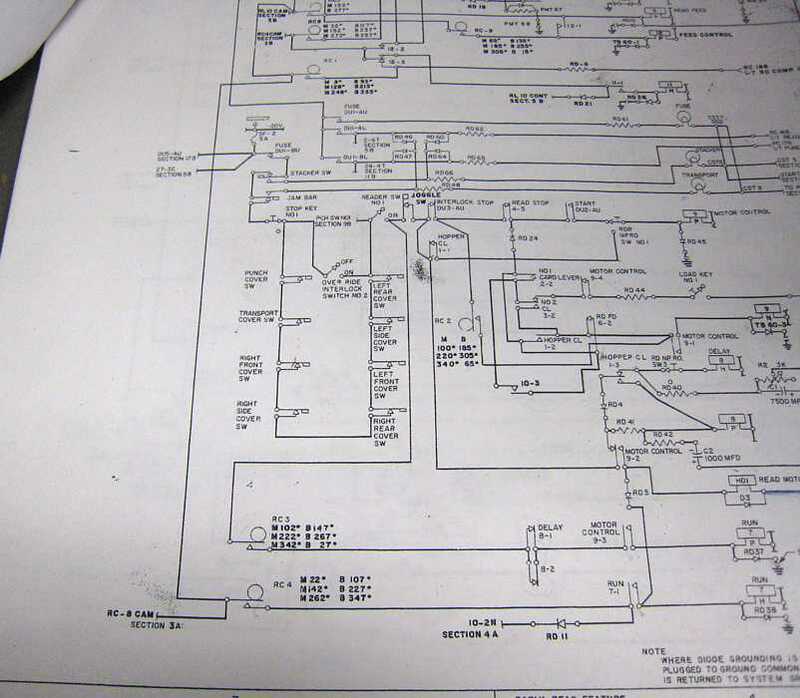 "We" have started to use the Liebert by the observation window as the other Liebert reports "a compressor problem". apparently not so - system works well. slightly easier - they are HEAVY BULKY beasts. 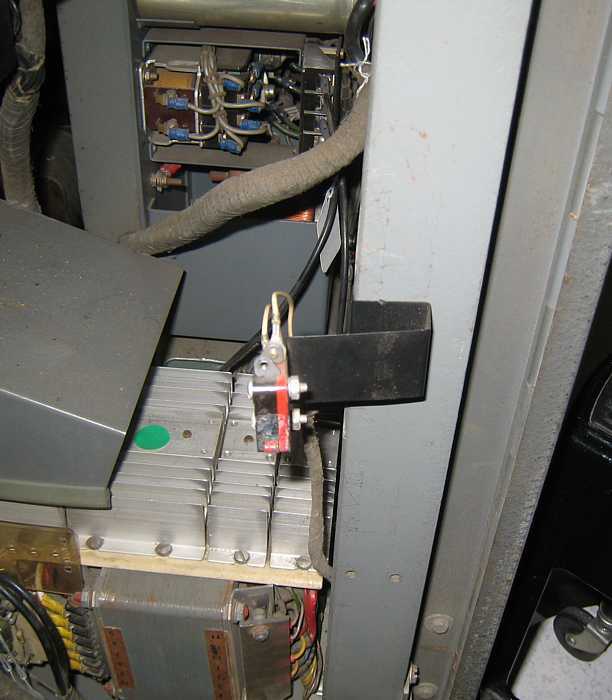 The UPS reports "Inverter Problem"
was in the wrong position. 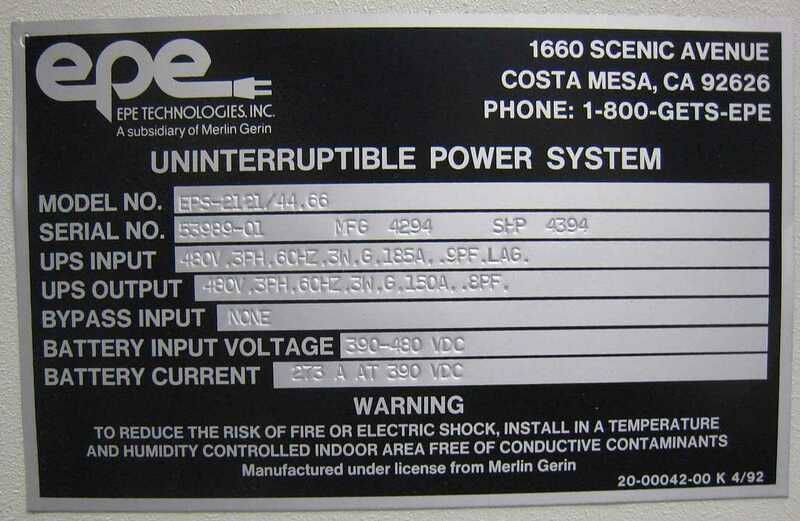 "UPS Output - 480 V, 3 PH, 60 HZ, 150 A, "
"Battery Current 275 A at 390 VDC"